Well, it seems all but apparent that Bobby Parnell’s fine season will be coming to an end this month. According to MetsBlog, Parnell is not even close to resuming any baseball-related activities. Parnell was placed on the DL on August 6 with a neck injury. He had an epidural shot to alleviate the pain, but so far it has not worked. Parnell is going to get another shot soon and if that does not work, surgery is probably the next step in the process. So, reading through the tea leaves, it’s all but certain Parnell’s season is over. And what a season it was. Finally tapping his vast potential, Parnell blossomed this year as the Mets’ closer. No longer did he have to worry what kind of role he was going to have. The ninth inning job was all his from the start and he nailed his audition. For the year, Parnell saved 22 games (blowing four saves) and in 49 games he posted a fantastic ERA (2.16), WHIP (1.00) and BAA (.211). Parnell had a lot of success this year, mostly because, for once, he did not throw. This year he finally committed to pitching. In exchange for a dip in velocity, Parnell had better location on his fastball this year. He was also dazzling with his standout knuckle curve. He, in essence, became the complete package at closer. While the Mets, for the most part, were struggling this year, Parnell shined. He was even the center of many trade rumors, as teams like Boston and Detroit needed help in the bullpen. 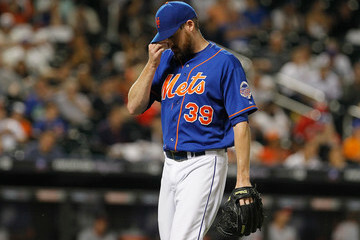 However, the Mets needed to be blown away, as they were not going to give up Parnell very easily. After years of trying to find a steady, reliable closer, they felt Parnell could be a mainstay in the bullpen for years to come. While the absence of Parnell the last couple of weeks has been another drain for a team that seemingly is void of any good news lately (but hey, they have won two games in a row), this injury shouldn’t be too serious. Parnell should probably have no trouble reporting to Port St. Lucie in the spring. While the Mets need to make some serious upgrades in the offseason, closer is one spot that does not have to be addressed, as Parnell—even in a shortened season—has showed he’s the future at the position. This isn’t too serious? If he needs neck surgery, you don’t know how long he could be out. I think that Parnell’s leap forward came last year. He improved upon his 2012 numbers but in my mind, the big change came between 2011 and 2012. Let’s hope that he’s ready to go for Spring Training. When the season started there were many doubters, including me, who never thought Parnell could pitch in the 9th inning. This was because when Parnell was on the mound in the 9th, bad things would happen, part of it to blame on him and part of it to blame on his fielders who have a knack of coming up short when he was on the mound. In the beginning of the season, Parnell didn’t convince any doubters(remember Colorado?). This was partly because he didn’t get many save chances(just 4 in April), and when he did get chances, he didn’t convert them(blown 2 of his 1st 4 chances). He even got his 4th win before his 4th save! However, as the season progressed and as the weather got warmer, Parnell, along with all the other pitchers started to pitch better. He got more save chances and he also started to convert them. He had a good season statistically, but he did a blow a few needed games in my opinion.